Read these story apps with your young students. Enjoy these FREE book apps! 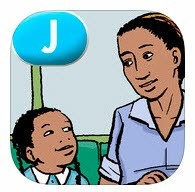 Learning A-Z, from Language Technologies, Inc., has many other free titles. Definitions of key words and the simple language make books ideal tools for language lessons. 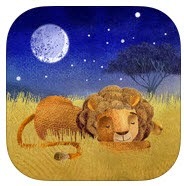 This interactive book for young children allows them to help the animals prepare for bedtime through seven interactive scenes. This simple story is perfect for practicing verb tense, WH questions, prepositions, and labeling actions. Shout Science! 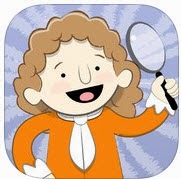 is a comic storybook app for readers ages 7-11. It consists of three narrative biographies that take place during the Scientific Revolution in Europe. Good for making predictions, inferences, and answering complex questions. 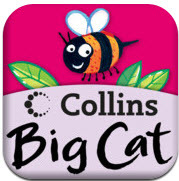 Read and create simple stories with eight FREE Collins Big Cat apps by Harper Collins Publishers Ltd. Check out my 2013 post describing these apps. 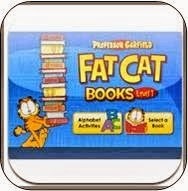 Professor Garfield's Fat Cat Books - #1 By Paws Incorporated are perfect to use when working on phonemic awareness.